When David Dill and Paul Purser met at the Mississippi State University School of Architecture in the late 2000’s, the economy was in the tank. “It was a bad time to be looking for jobs as intern architects,” Dill recounts. He took a mission internship with eMi (Engineering Ministries International) in Kampala, Uganda after graduation in 2009. Purser, with one year left in college, began a series of odd jobs in construction. “We passed a duplex the other day on Old Canton where we did siding,” Purser reminds Dill. General carpentry? “General anything we could make money on,” Purser laughs. That was then. D + P is now. The design-build firm, established in 2011, is making a name for itself with Purser as contractor and Dill as builder. From a 2,200 square foot warehouse on the corner of McTyere and Wilson in Midtown, Dill recalls their early days, working from his mother-in-law’s garage. They needed space, she needed her garage back. If that seems broad, maybe it’s because D+P has set out to be a multi-faceted provider of solutions for a number of unique situations. “The idea has allowed us to do some interesting things like trade show booths for Thimblepress, DPM Fragrance and photographers Adam + Alli,” Dill says. 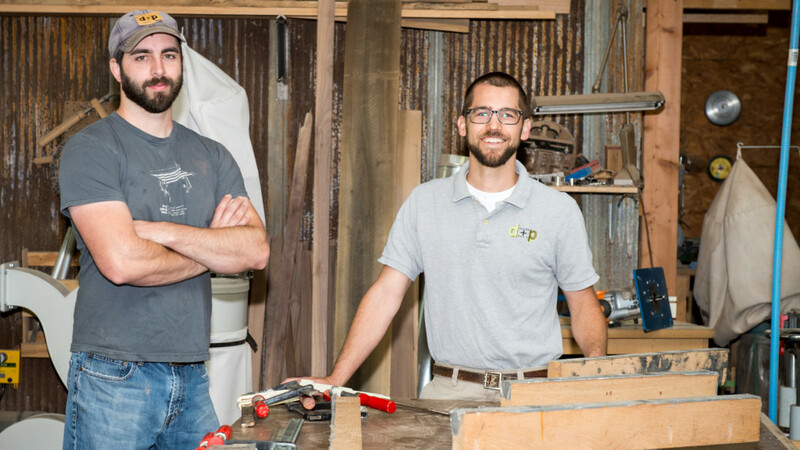 At the center of D+P’s designs lies live edge wood planks, custom milled, a fulfillment of their promise to keep as much wood out of landfills as possible. 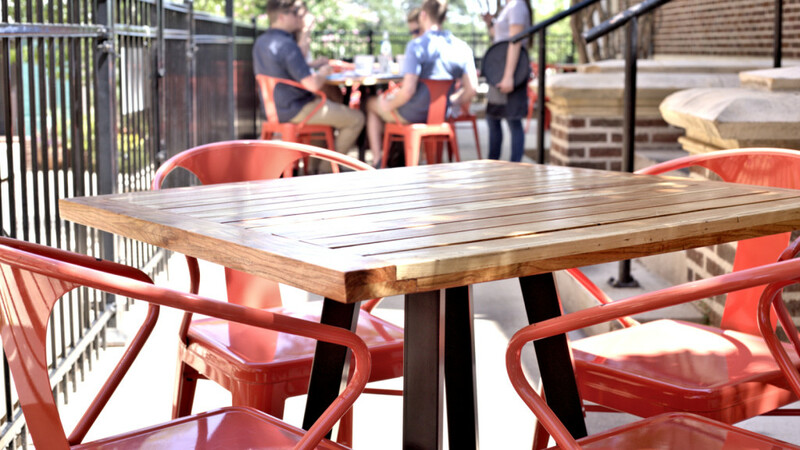 Table tops found in Fondren’s CAET Wine Bar, Saltine Oyster Bar and at Whole Foods came from a tree once slated for that fate. Lately, Dill has seen more of the spotlight instead. He’s worked on recent movies like James Franco’s “As I Lay Dying” and as general contractor for John Krasinski’s “The Hollars,” set for a late summer release. “Paul’s truck made an appearance,” he laughs. Those outings from the shop are becoming few and far between. 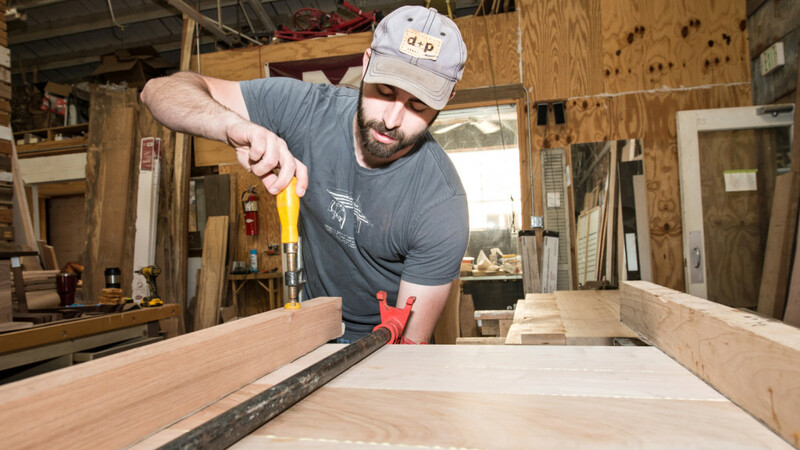 Dill can barely break away from his custom furniture work. That aspect of their business, he says, isn’t going away any time soon. “It’s a consistent business and we’re working on some unique designs we can recreate.” D+P is shipping kids’ tables and chairs out at least a few times a month. A recent order was set to ship to a Brooklyn, New York to a Montessori school. “We hope these prototypes ‘take off’ as production pieces,” Purser says. Before D+P, Purser nor Dill had never heard of Midtown. But the “neat little community of artists and makers” has helped them build their business and gain exposure. From glass artist Andy Young to welder Austin Richardson and lighting expert Stephen Barnette, D+P has been bolstered by the community spirit. Purser and Dill keep that in mind as they strive to be the best in their field.